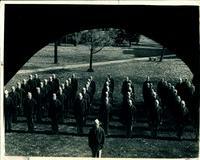 A platoon of Naval Air Cadets information on Central campus just before early morning found school classes there. More than 100 of these cadets now study at Central and the school’s flying near Pella. 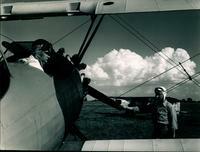 Flight Instructor, Norman F. van Gorp (spud) spinning the propellor. Richard Vander Leest and William Van Zee haul gas for the airport. The school used about six thousand gallons per month. In the background of this photo Pete Heerma’s school bus can be seen. Flight Instructor, Earl Pohlmann, in ground instruction with student group. Flyers at calisthenics. This photo was printed in the newspaper, the Pella Chronicle. 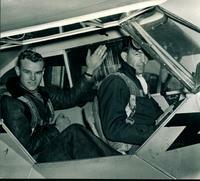 Student and Flight Instructor in plane. Three cadets in formal wear out in the snow. Two girls sitting on a plane, location most likely airport. Flight Instructor, Earl Pohlmann stands by a plane giving cross country and instrument training to Paul Metcalf in the cockpit. 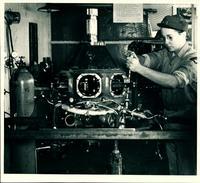 Engine overhaul being done by Bill Trussle.